Moschino’s Fall 2017 Runway Show at Milan Fashion Week opened with a number of dramatic looks by head designer Jeremy Scott’s who drew inspiration from the favorite Transformers™ toys. 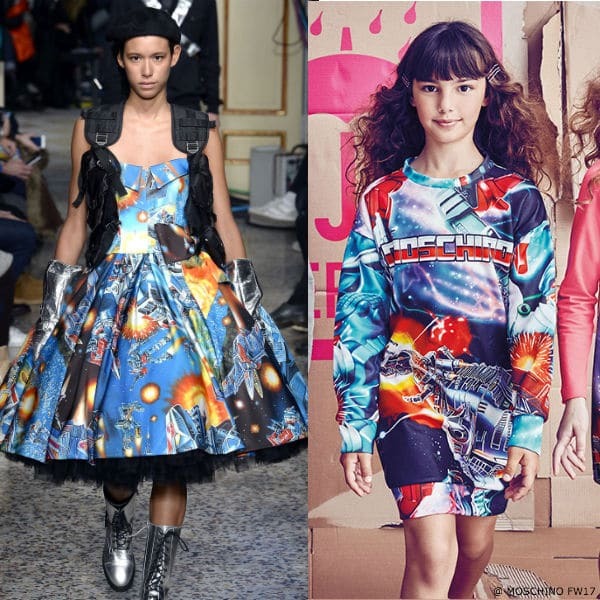 You’ll also find a number of adorable Mini-Me versions featuring the exclusive Moschino Transformers™ Space Battle Prints in the Moschino Kids Collection. 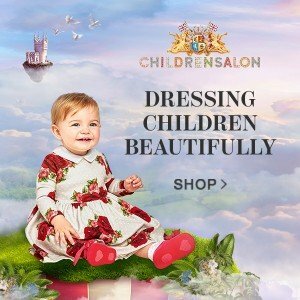 Here are a few of my favorite Daddy / Mommy & Me looks by Moschino available online and ship worldwide. 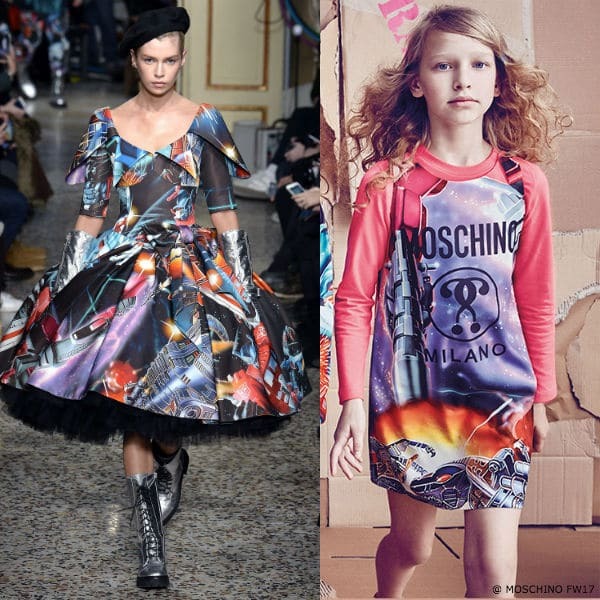 Love this MOSCHINO Girls Mini-Me Transformers Dress inspired by the Moschino Women’s Pre Fall 2017 Collection featured on the runway at Milan Fashion Week. 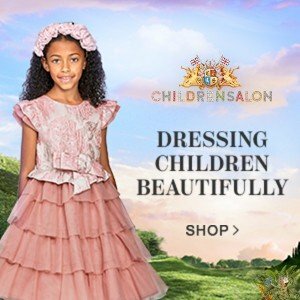 This simple yet elegant, mommy and me dress for girls is made of a softy textured lightweight crêpe and has a comfy silky. Complete the look with a pair of matching Transformers™ print shoes or classic Moschino logo ballet flats. This Moschino Boys Mini Me Transformers Blue Print Outfit is the perfect look for your little Transformers fan. This Mini-me t-shirt and pants by Moschino feature an exclusive blueprint, in collaboration with toymaker Hasbro. Complete the look with a pair of matching MOSCHINO Boys black leather Transformers™ print trainers. 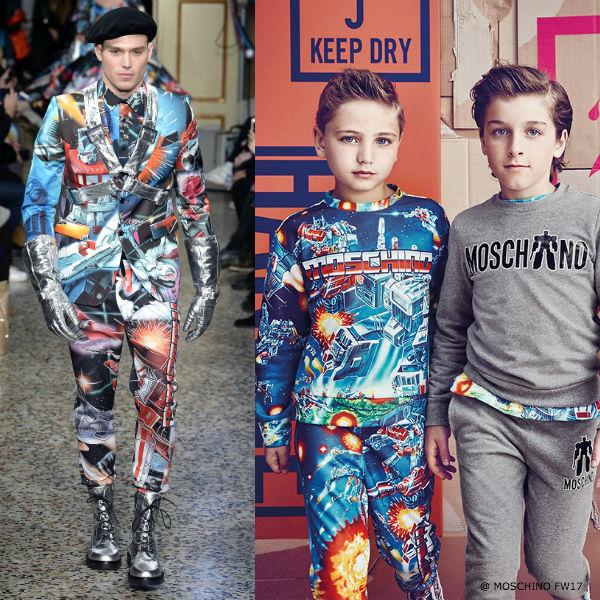 Another cool look for boys is this MOSCHINO Boys Transformers™ Tracksuit with its shiny Transformers logo print. Here’s another cool streetwear look for boys by MOSCHINO featuring this black Mini-me Transformers™ sweatshirt printed with grey iconic characters and bold logo lettering. Complete the look with a pair of casual black Moschino sweatpants with the designer’s logo print on one leg and a stretchy, elasticated waistband ensuring a comfortable fit. Complete the look with a pair of matching MOSCHINO Boys black leather Transformers™ print trainers. 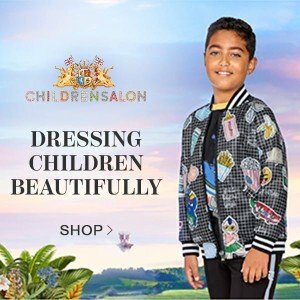 Your little one will love this super comfy grey tracksuit by Moschino Kid-Teen with its shiny Transformers logo print, made in a stretch cotton jersey, with a super soft fleece lining for keeping extra warm. Complete the look with a pair of matching MOSCHINO Boys black leather Transformers print trainers.